Now that we’ve opened our second kids’ gym here in Vernon Hills, we’re not just offering kids fitness programs. Hot Ground Gym is also the newest kids’ birthday party venue in the area, and we’re ready to show you why we’ve been voted as the best active birthday party in the Chicagoland area by Basharoo. With all due respect to the other kids’ birthday party places in the area, Hot Ground Gym offers something new and exciting that they just can’t match. Let’s take a look at a few of the reasons that parents in the know are choosing us for birthday parties. When it comes to kids’ birthday party ideas, the same venues come up again and again. There are the arcades, laser tag, bounce houses, and…and…well, those are the big three. And whenever you get a birthday party invitation addressed to your kid, you’re probably wondering which of those three you’ll have to drive them to again. Now we’re not saying that those places can’t be fun, because they can. But after a while each becomes pretty repetitive, and a new experience is something that kids will relish. There’s something to be said for new and different. Hot Ground Gym is a completely new idea, and best of all it’s perfect for boys and girls alike. It’s also great for all ages. Younger kids love it because it’s like the ultimate playground, while older kids who might balk at the idea of a “playground” see it as a ninja warrior course. We have the right people in place to ensure that everyone has a great time for the entire 90 minute party. …and that’s a good thing! Hot Ground Gym is a great place for kids to move around in a safe environment and get wound up. Kids want and need to move, and if they can do so while having fun, all the better! Of course, we do everything we can to focus that energy into something that stimulates the problems solving parts of their brains and get them to work as a team to surmount any obstacles that get in their way. Don’t tell the kids, but they’re going to learn something while they’re here! 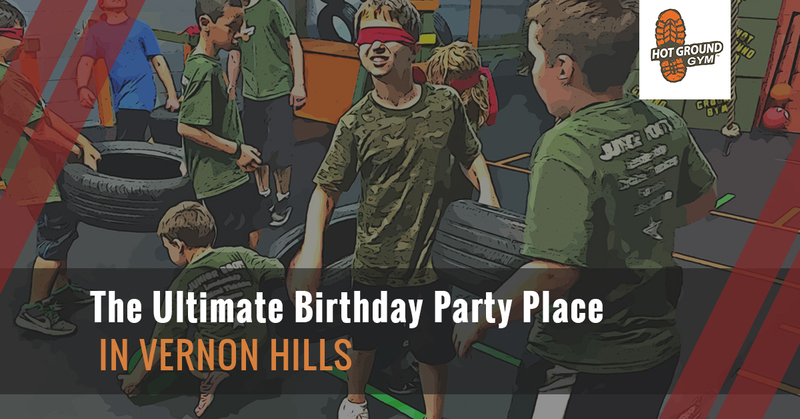 While most kids’ birthday party places just let the kids run wild, our birthday venue keeps things a bit more structured as to keep the kids on task. In fact, our expert party runners make sure that every child is included and heard as everyone moves through the course. They’ll leave not only having a good time but also filled with a sense of accomplishment at having worked on a team to finished strong. There will always be new arcades and bounce houses. But how often does something truly new come about in the world of kids’ birthday party venues? We started Hot Ground Gym in Northbrook, worked out the kinks, and are now ready to offer the best version available to the parent and kids of Vernon Hills. Find out more about our birthday party offerings right here.